Your wild heart is calling you. You’re longing for deeper and more authentic connections with other people, the earth, yourself, and the sacred. You want to write, paint, dance, teach, create, and you’re full of ideas, but you doubt the value of what you have to offer. You have gifts and wisdom to help in the transformation of the world, but you don’t know where to start. I SEE YOU and I want to invite you to join me on a journey. A dozen years ago, I followed my wild heart out of a government job, into a non-profit job that took me around the world for the cause of social justice and storytelling, and finally into self-employment as a teacher, writer, coach, conversation host, edgewalker, wisdom-seeker, and story-catcher. I see the way your heart wants to be free. I recognize your longing to do something bigger. I honour the struggle you’ve gone through to get where you are. I know the courage it takes to step out on the edge. I am here to serve as your guide in the journey to YOUR WILD HEART. 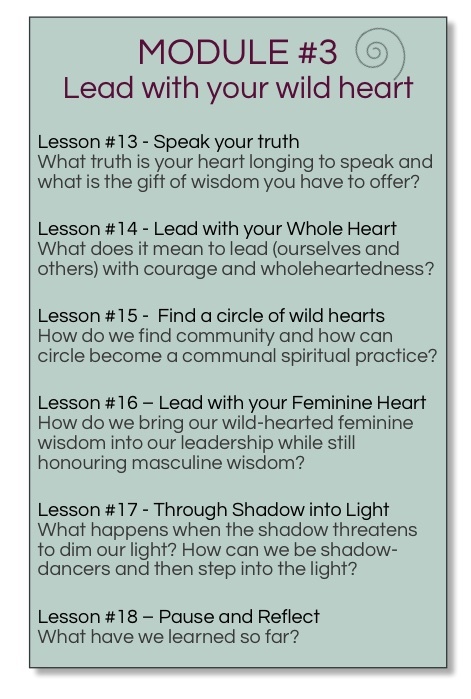 Lead with your Wild Heart is an intensive personal leadership program for women. It’s about unleashing and equipping edgewalkers, artists, changemakers, lovers, visionaries, teachers, storytellers and imaginal cells – just the kind of women the world needs more of RIGHT NOW. It’s about living boldly, authentically, and passionately, from a place of feminine, holistic (mind, body, and soul) wisdom. It’s about honouring the “wild woman” that Clarissa Pinkola Estes talks about in Women Who Run With Wolves and letting her step out in full glory. It’s about giving voice to the “emotional creature” that Eve Ensler talks about. It’s about holding up half the sky and being dissident daughters. It’s about believing, as the Dalai Lama does, that the future depends on women. The world needs more women willing to offer their wild hearts into the service of healing, art-making, and change-making. We need more women who understand that leadership is – at its simplest – a willingness to help, and that leaders can be hosts rather than heroes. 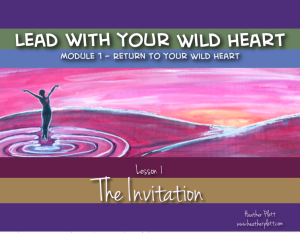 Lead with your Wild Heart has three modules. In Module #1, you’ll Return to your Wild Heart. 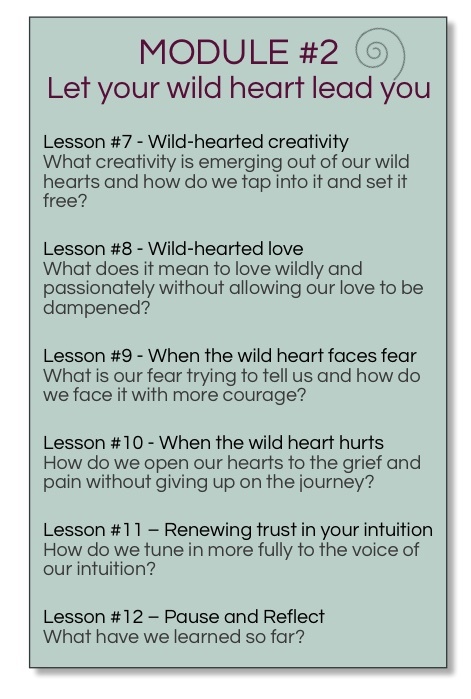 In Module #2, you’ll learn to Let your Wild Heart Lead You. 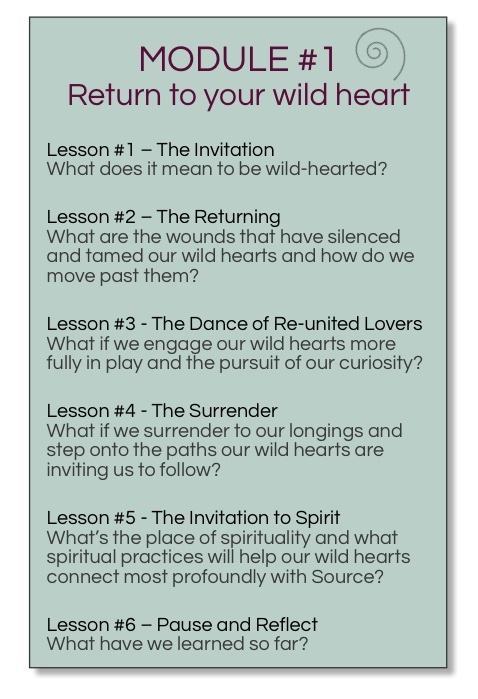 In Module #3, you’ll learn to Lead with your Wild Heart. Each module contains 6 lessons and creative practices and journal prompts. Along with each lesson, you will receive access to interviews with wise, wild-hearted women and men who have gained life experience and expertise in the themes of that lesson. I have invited the most incredible circle of people from around the world to share their wisdom with you and they have done so in a beautifully generous way. You’ll hear from people with expertise in music, activism, sacred art-making, dance, mud building, international development, public speaking, circle hosting, community building, writing, earth stewardship, leadership, storytelling, feminine wisdom, urban gardening, juggling, play therapy, spirituality, yoga, sexuality, social justice, coaching, intuitive painting, consulting, grief, meditation, sound therapy, entrepreneurship, courage, and so much more. Interviewees include Christina Baldwin, Janell Kapoor, Marianne Knuth, Jodi Crane, Julie Daley, Michael Jones, Thomas Arthur, Christine Claire Reed, Filiz Telec, Ronna Detrick, Peter Block, Gail Larsen, Lianne Raymond, Michele Lisenbury Christensen, Connie Hozvicka, Deborah Frieze, Chris Zydel, Desiree Adaway, Hali Karla, Cath Duncan, Hiro Boga, Lisa Wilson, Jen Louden, Ann-Marie Boudreau, Kate Swoboda, Kathy Jourdain, and Rachelle Mee-Chapman.  Learn more about this amazing wisdom circle. Here’s a sample of the juicy conversations you’ll get to listen in on. This program is a rich journey that you can go through at your own pace. If you want to go even deeper into your personal exploration, the option of one-on-one coaching is also available. 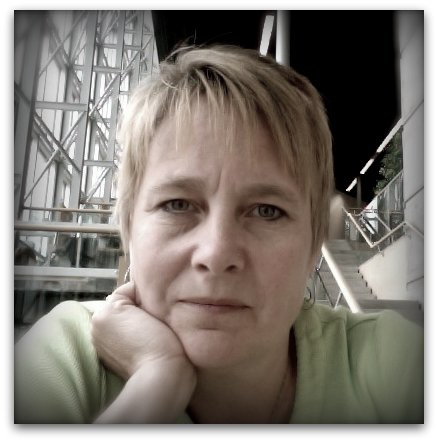 My name is Heather Plett and I am here to help women live and lead with more courage, resilience and authenticity. I think of myself as a sherpa who helps guide people and share the weight of their burdens as they make the meandering journey up the mountainside to the place where they feel their longings are calling them. Having been through a lot of transition, grief, and growth in my life has made my lungs strong for when the air gets thin and the people I guide need extra support. My wild heart took me away from a senior-level career in leadership in government and into one that engaged my passions for global justice, storytelling, and leadership in an international development non-profit. After a number of years (and a lot of learning) in that role, I left that to follow the call to serve as a life-journey sherpa through teaching, coaching, writing, and hosting conversations and retreats. 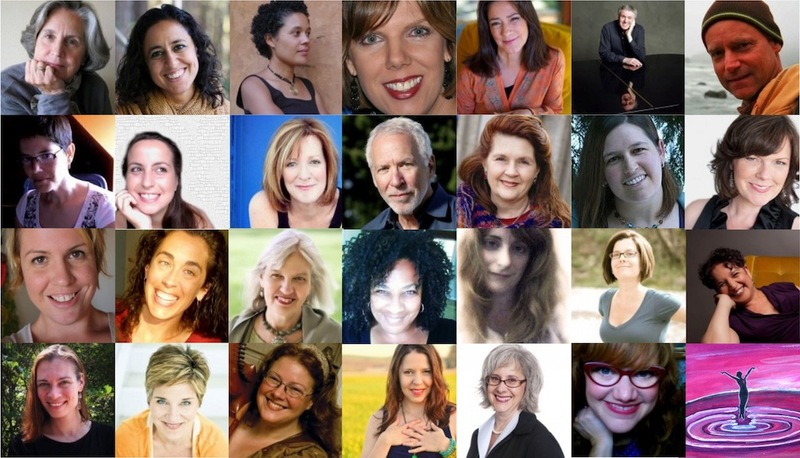 I am a member of the international Art of Hosting community as well as the Gather the Women Global Matrix, and have spent three years at the Authentic Leadership in Action Summer Institute. I have been privileged to travel the world gathering stories of courageous women, like Elizabeth in Ethiopia, Fidelis in Kenya, and Kabita in India. Together with my husband, I am raising three courageous young women. I help women live and lead with courage, resilience, and authenticity. I created this program for the woman I was fifteen years ago. New to leadership and motherhood at the time, I took to both intuitively and wholeheartedly. Before long, though, I was told to keep my feelings out of leadership and to develop a thicker skin. Trying to fit in and be the kind of leader I learned about in all of the workshops I was attending at the time, I shut down my heart in favour of my head. I quit doing art and I ignored my longings and my spirituality. It took several years to recognize that the longing in my heart was pointing me back toward feminine wisdom and wholehearted leadership. Want to sample the product before you decide to buy? Click on the image below to download the first lesson free, complete with an interview with the wild-hearted Chris Zydel. I am deeply committed to this program, and I believe that you will get incredible value for your money, but if you are not satisfied by the third lesson, I will refund you for the full amount. This course is valued at $95, but it’s now available on a “pay what you can” basis. I am committed to nurturing leadership in passionate women who want to contribute their gifts to the world, whether or not they have financial resources. I offer you my gift so that you can nurture and use yours. You choose how much you can (or want to) spend on Lead with Your Wild Heart, and it will be yours, no questions asked. I offer this as part of my commitment to living in the Gift Economy. I only ask this… if you cannot pay the full amount, make a commitment to yourself that some day in the future, you will pay it forward in some way. Lead with Your Wild Heart is all about learning to use your unique giftedness to serve the world, so find a way to do that, and I will feel that payment has been made. (Feel free to share your stories or commitments in the comment field of the payment form.) The more we spread our gifts, the more we contribute to a more beautiful world.